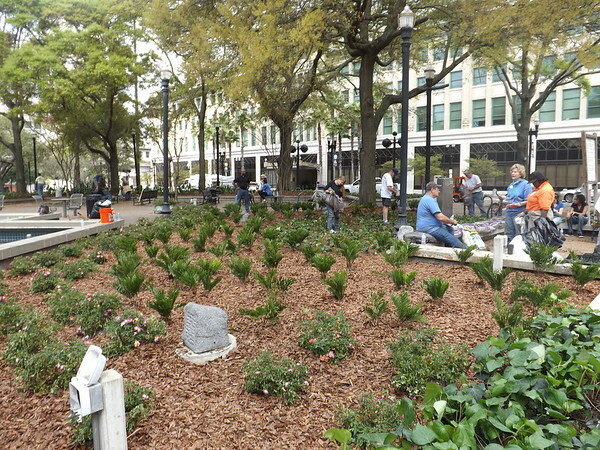 On Saturday, March 22, 2014, 100 community volunteers worked to beautify Hemming Plaza by planting shrubs and flowering plants. Here are a few sights and scenes from the beautification effort. Now this is sacrificing for the core ..... someone's whole Saturday devoted to working the project. This is the kind of thing that gives me hope for the future. People do sometimes care about their city .. and prove it by volunteering like this. Thanks for the photos Ennis. Looks great, but good luck controlling the ivy. DVI should be doing more things like this. Great job! Agree with mbwright, when I passed by on bike yesterday I was also curious about the ivy choice. Looks excellent. Love it. I can't wait to come enjoy it during one spark in a few weeks. Wonderful! In my opinion, it is this kind of grass roots, community action is what builds liveable cities. ^^ Good point. The park belongs to all of us. You mean all those folks who did the planting didn't read the fine print that says they have to come back every 10 days to prune and weed?